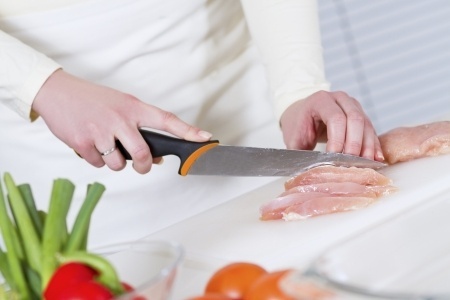 To prevent cross-contamination, clean surfaces thoroughly after preparing raw meats. Contaminated food is the worst. These kitchen food safety tips for defrosting dinner, avoiding cross contamination while preparing foods, cooking entrees throughly, and eating hot foods while they're hot will help ensure there won't be any food-related tummy aches in your home. Many germs can spread long before you pop the entree in the oven. E coli, hepatitis A, and salmonella - the most common contaminants - can find their way onto a sponge or dishcloth; and you in turn, can then spread the bacteria all over your kitchen unless you make an effort to stop them. This will prevent you from spreading meat-, poultry, or fish-borne bacteria onto refrigerator doors, cabinet handles, and countertops, where they'll be lying in wait next time you reach for a leftover slice of pizza. In addition to washing your hands, you can help prevent cross-contamination by washing in hot, soapy water the utensils used to prepare raw food. That includes all knives, cutting boards, and serving platters that have held raw meats, fish, or poultry. When grilling, don't serve meat on the same platter you used to carry it outside before cooking. If your kitchen counter comes in contact with even a drop of juice from uncooked meat, poultry, or fish, clean the area with hot, soapy water and paper towels - not the sponge you use daily. To kill all the germs, however, you'll need to clean the surface with a mild bleach solution (one part bleach to nine parts water) or use a commercial disinfectant such as Lysol Antibacterial Kitchen Cleaner Spray. Kiitchen sponges and dishcloths - the very items that are supposed to help you get rid of lurking germs - can be part of the problem unless you clean them regularly. You should replace your sponges every two weeks. Regularly throw dishcloths in the washing machine - and always use hot water and bleach. Always eat food while it's hot, and refrigerate leftovers promptly. Prepared or cut food, including fruit, should not sit unrefrigerated for more than two hours in cool weather, one hour when it's warm. If the food item has been left out, toss it. Resist the urge to taste-test if you're unsure about something - even a small amount of contaminated food can make you very ill. Put dates on leftovers in the fridge so that you can use them within a safe period. Determining a food's safety by odor or appearance is risky; spoilage isn't always obvious. Finally, wash produce before you eat or cook it, to remove surface germs. That way you won't contaminate other surfaces after touching these foods.